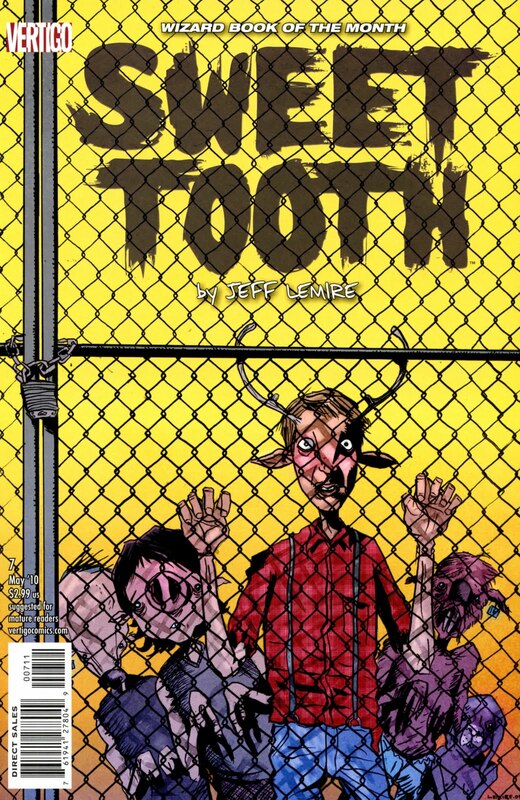 There is something incredibly dark, something terribly bleak about this installment of Sweet Tooth. If we are going to get to a brighter day in this story, then this is the beginning of the necessary darkness. Jepperd, we learn, is a much more complex, yet at the same time more basic, character than the man who betrayed Gus. It seems he did it all for love, but that love has ultimately turned him into a broken man. Where he goes from here is hard to predict (and thanks to Lemires exemplary plotting, there is literally no clues as to how his tale will end. I hope he finds redemption, I really hope he finds a way to assuage this blackness and despair). Gus is in a scenario that is dire. Who knows what Dr Singh wants with him. It does not look good. The conditions are appalling, the one child who can articulate the desperate straits they are in seems to have come from a situation more dire than Gus. It is a horrible issue – the effects of a world decimated by plague are laid bare to the reader, across splash pages and tiny panels where the horror is compressed but not diluted. All love has gone – what remains is an absence of humanity, an abyss. Lemire chronicles the loss of a world and how its inhabitants react to that loss. It is a stunning achievement.